Caine, Rachel. 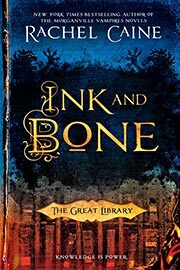 Ink and Bone . NAL 2015. What if: The Great Library of Alexandria was never destroyed. 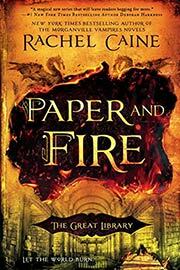 Summary: Series of Ink and Bone , Paper and Fire , Ash and Quill , and Smoke and Iron . Series note: First volume of The Great Library. Published: NAL 2015 (045147239Xw88 androidBUY), 2016 (0451473132BUY); Allison & Busby 2015 (0749017228BUY). Caine, Rachel. Paper and Fire . NAL 2016. Series note: Second volume of The Great Library. Published: NAL 2016 (0451472403BUY; Allison & Busby 2016 (0749017325BUY); Berkeley 2017 (0451473140BUY); Turtleback 2017 (0606403612BUY). Series note: Third volume of The Great Library. Published: NAL 2017 (0451472411BUY); Allison & Busby 2017 (0749017422BUY); Berkeley 2018 (0451473159BUY). Series note: Fourth volume of The Great Library. Published: NAL 2018 (0451489217BUY); Allison & Busby 2018 (0749022019).